Interstate 295 in the Delaware Valley forms a commuter route serving Wilmington, Delaware, South Jersey, Trenton and Bucks County, Pennsylvania. 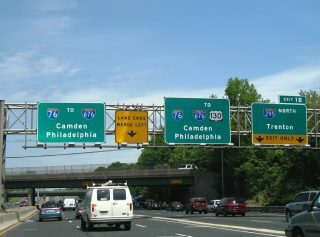 Orientated as a bypass route for Philadelphia, the freeway generally serves local traffic, with through traffic taking either the parallel New Jersey Turnpike, or Interstate 95 through southeastern Pennsylvania. Interstate 295 crosses the twin span Delaware Memorial Bridge between New Castle, Delaware and Pennsville Township, New Jersey. Interstate 295 between Dupont Parkway at Farnhurst and the New Jersey Turnpike at Deepwater is maintained by the Delaware River and Bay Authority (DRBA). 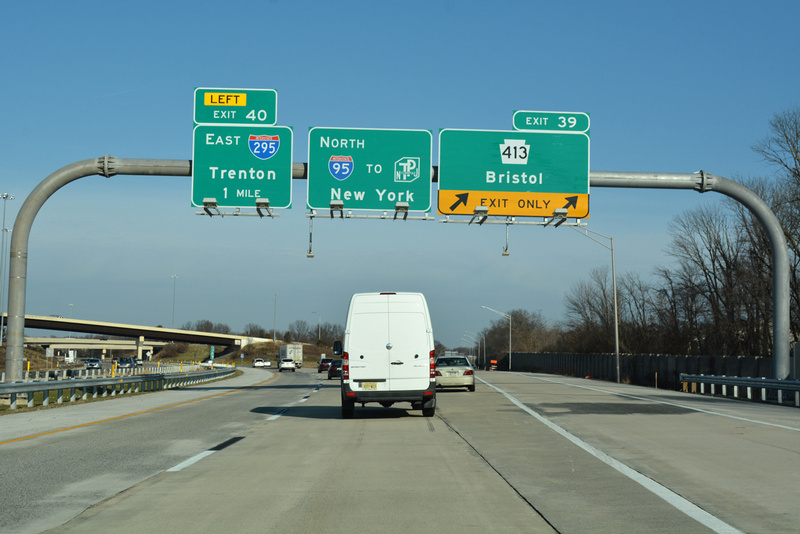 Signing practices along this stretch differs from Delaware Department of Transportation (DelDOT) and New Jersey Department of Transportation (NJDOT) standards. Through South Jersey, I-295 serves rural areas of Salem an Gloucester Counties to Paulsboro, Woodbury and Bellmawr to the south of Camden. There the route converges with the east end of Interstate 76, making a dog leg northward along side the North South Freeway to Mount Ephraim. 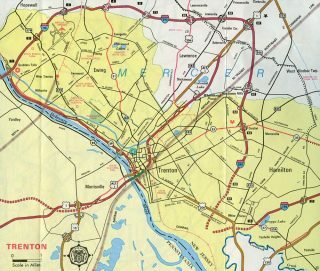 Turning more east, Interstate 295 winds through the communities of Haddon Heights, Barrington, Lawnside and Cherry Hill Township to Burlington County. 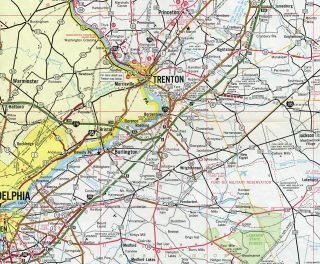 The freeway and New Jersey Turnpike parallel one another closely on the northeastern swing through Mount Laurel Township before separating at Westampton Township. I-295 stays closer to the Delaware River, bypassing Burlington to Bordentown and the Trenton vicinity. The northernmost extent of I-295 follows the Trenton Beltline through Hamilton and Lawrence Townships to U.S. 1. Prior to 2018, I-295 ended opposite Interstate 95 at their exchange with U.S. 1 north of Trenton. 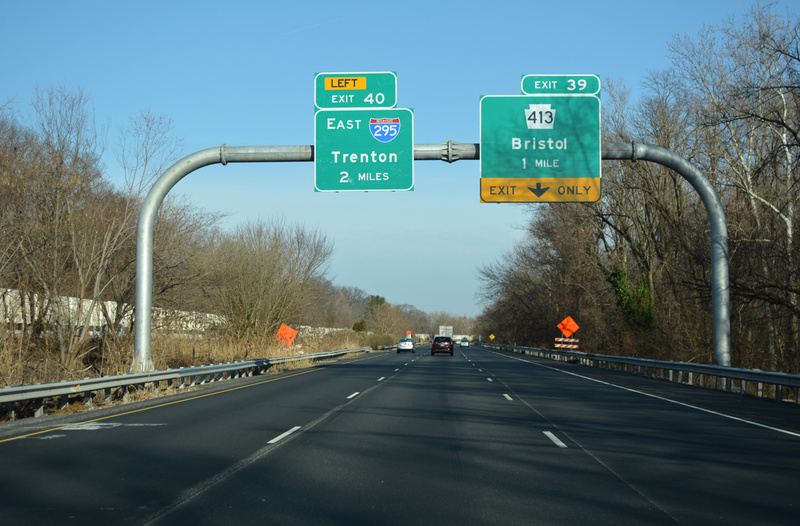 Sign changes made from January to March 2018 in Mercer County, New Jersey, and through late Spring 2018 in Bucks County, Pennsylvania, renumbered Interstate 95 between Bristol, PA and U.S. 1 as an extension of Interstate 295. This included the Scudders Falls Bridge, which is being rebuilt as a tolled crossing. The new flyover ramps linking Interstate 95 with the Pennsylvania Turnpike interchange at Bristol opened to traffic on September 23, 2018.17 Completion of the missing link coincided with the realignment of I-95 onto the Pennsylvania Turnpike east and the New Jersey Turnpike north to Exit 6. Interstate 295 is part of High Priority Corridor 64: Camden-Philadelphia Corridor. 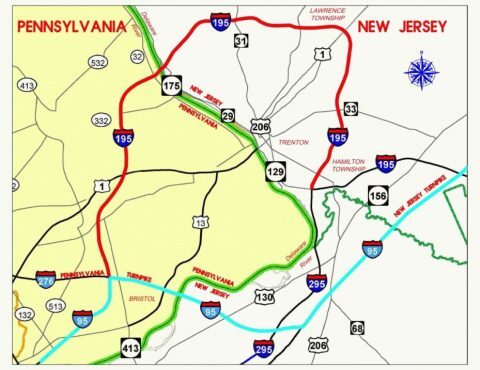 Before construction broke ground, New Jersey and Pennsylvania petitioned AASHTO to extend Interstate 195 west from Hamilton Township over I-295 north to Lawrenceville and over I-95 southwest to Bristol as part of the Pennsylvania Turnpike/Interstate 95 Interchange Project. This was conditionally approved on May 4, 2007, with final approval expected once construction was complete. This map was previously posted on the PA Turnpike / I-95 Interchange Project web site. 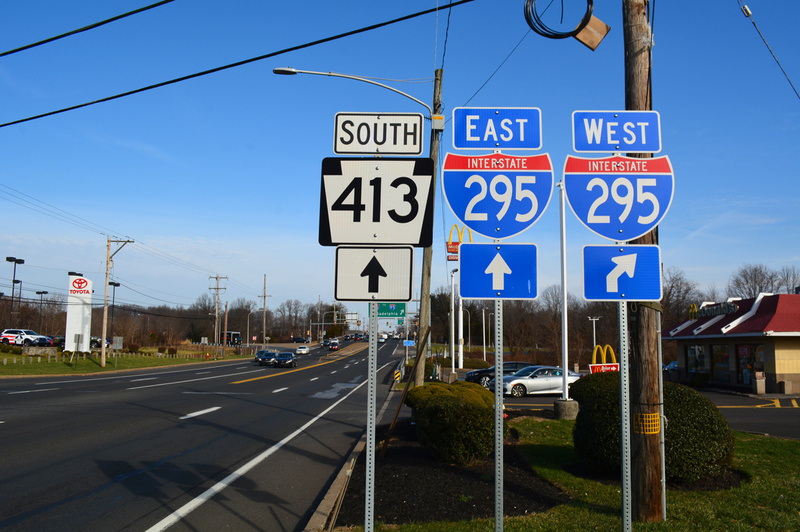 It showed the proposal to extend Interstate 195 west to Bucks County, Pennsylvania and the future realignment of Interstate 95 onto the Pennsylvania and New Jersey Turnpikes. Although construction had yet started on the ramps linking I-95 and I-276, renumbering changes were again made, with the Pennsylvania Turnpike web site referencing Interstate 395 as the new designation for I-95 between I-276 at Bristol and I-295 at Lawrenceville. This coincided with leaving I-295 in place from Lawrenceville southward. PA Turnpike / I-95 Interchange Project construction stage maps referenced I-95 north of I-276 as I-195 in May 2013, but then as I-395 in September 2014. The I-395 numbering was never finalized and the plan prior to 2007 of extending I-295 west to Bristol, Pennsylvania was again submitted to AASHTO in 2015. The FHWA approved the renumbering of I-95 as an extension of I-295 on May 20, 2015. This coincided with approval of realigning I-95 east over I-276 from Bristol into New Jersey. The often delayed PA Turnpike / I-95 Interchange Project was initially thought to commence in 2007 and be completed in 2010. Initial construction finally started in 2010. 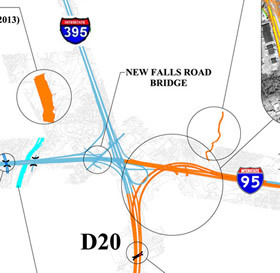 Work not only involved the addition of ramps linking I-95 and 276, but also adjacent projects. This included a new mainline toll plaza for I-276 and widening of the Turnpike mainline. Stage 1 construction through 2018 involved the aforementioned main line plaza, the two flyover ramps needed to realign the I-95 mainline, and work at the Bristol Interchange with U.S. 13. Stage 2, adds the remainder of the ramps linking Interstates 95, 276 and 295, with work underway from 2017 onward. Anticipated for 2025 or later, Stage 3 will add a second Delaware River span for northbound traffic along the Pennsylvania Turnpike. Contract 1, costing $159 million, was awarded on January 18, 2013 with ceremonial groundbreaking on the overall project taking place March 12, 2013.3 Contract 1 work through Fall 2016 affected Interstate 295 west of Essex Avenue and NJ 42 while primarily focusing on work to eliminate the express/local configuration of the North South Freeway at Gloucester City. Bids for Contract 2 were opened on December 19, 2013, with a low bid of $152.6 million.4 This contract was awarded on February 7, 2014 for reconstruction of I-295 east from the North South Freeway to NJ 168, with adjacent work on Ramps B, C and D. The completion date was December 15, 2017. Contract 3 is scheduled to run from Winter 2016 to Winter 2021. It involves construction of the new I-295 mainline over the North South Freeway. Contract 4 rounds out the work between spring 2020 and winter 2023, with final ramp movements completed for Ramp B, C and F.
Preparation work for construction of the new Scudder Falls Bridge started on January 4, 2016 with tree removal on both sides of I-95 between PA 332 and Taylorsville Road in Lower Makefield. This allowed for the installation of sound walls by Spring 2016. Tree clearing on the New Jersey side of the river started in fall 2016. Four and a half years of road construction to build the new twin span begin in early 2017.6 The first span should open in Spring 2019.14 Stage three of roadwork extends to Summer 2021. Tolling will be implemented when the first of the new bridges opens for southbound traffic. The Delaware River Joint Toll Bridge Commission approved E-ZPass rates of $1.25 for passenger vehicles and $2.60 for Toll-by-Plate traffic on September 26, 2016.14 Associated work redesigned the interchange with New Jersey 29 along the Delaware River to incorporate two roundabouts. 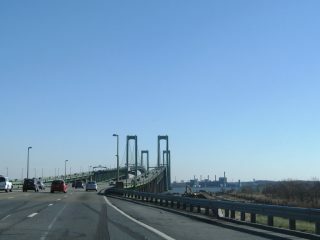 Approaching the Delaware Memorial Bridge along Interstate 295 north & U.S. 40 east. Photo taken 12/29/08. Maintenance, signage, and policing of Interstate 295 between U.S. 13 & 40 and U.S. 130 is the responsibility of the Delaware River and Bay Authority (DRBA). The DRBA is partially funded by tolls collected on the Delaware Memorial Bridge. Interstate 295 north at the former overlap with I-76 (North-South Freeway) in Bellmawr. Photo taken 05/20/07. The 2013-23 upgrade of the I-76/295 interchange eliminated the dual roadway of the North South Freeway that coincided with movements to and from I-295. The cancellation of the Somerset Freeway resulted in the decades old gap of Interstate 95 between Trenton and New Brunswick. Interstate 295 was shortened to end at U.S. 1 in 1993. 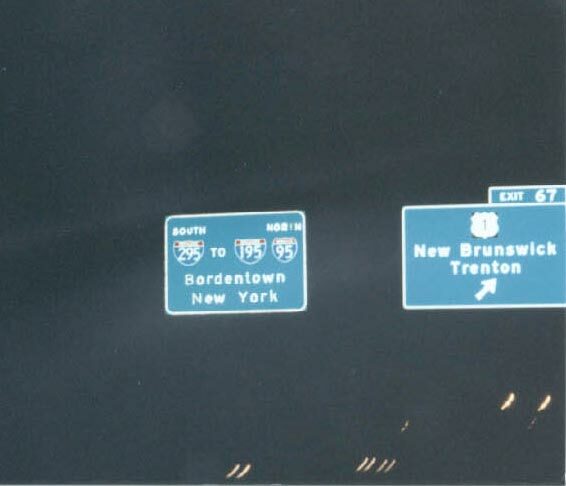 Button copy signs previously displayed “TO I-95 South”, as I-295 extended west to New Jersey 31 prior to the change. Vidcap taken 08/93. 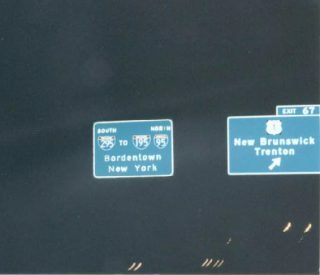 The former pull through panel at Exit 67 referenced Bordentown, which was the last portion of I-295 to open in 1994, and New York for the continuation of I-95 north along the Turnpike. Photo taken by Douglas Kerr (03/15/01). Long since replaced button copy overheads posted along U.S. 1 northbound at the exchange with I-95 south and I-295 south. 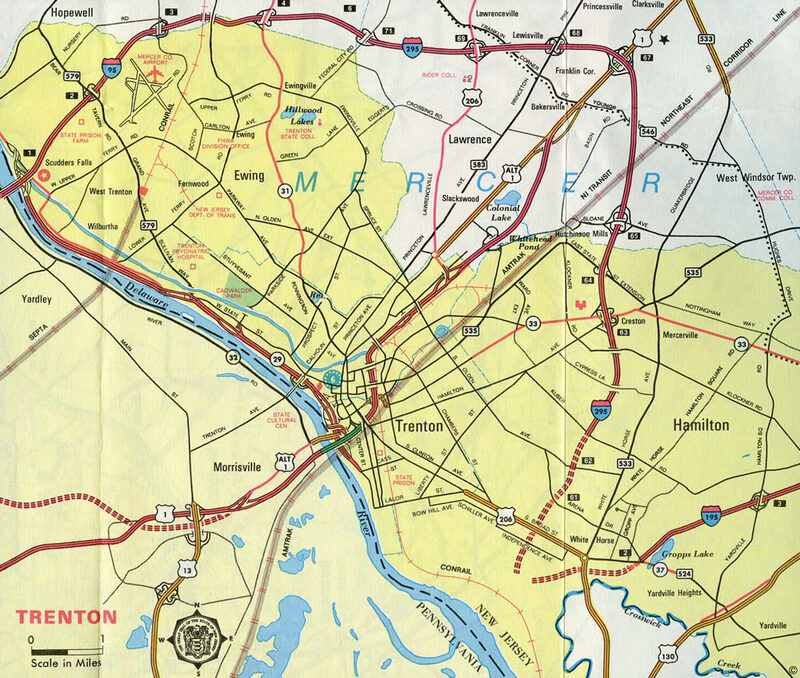 Changes made to the Trenton Belt Line in 1993 renumbered I-295 west from here to Exit 4 as an extension of I-95. The renumbering was made by order of then-Governor Jim Florio.12 Vidcap taken 08/93. 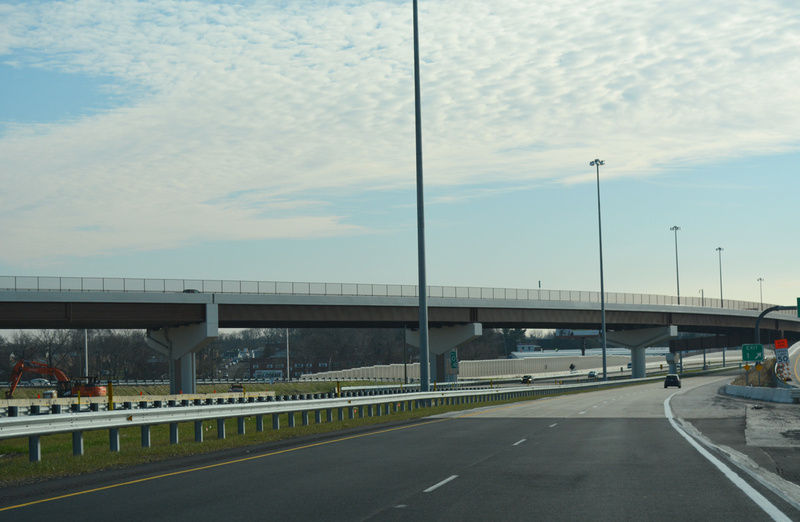 The Interstate 295 connection with I-95 in Delaware opened in conjunction with the Delaware Turnpike in 1963. 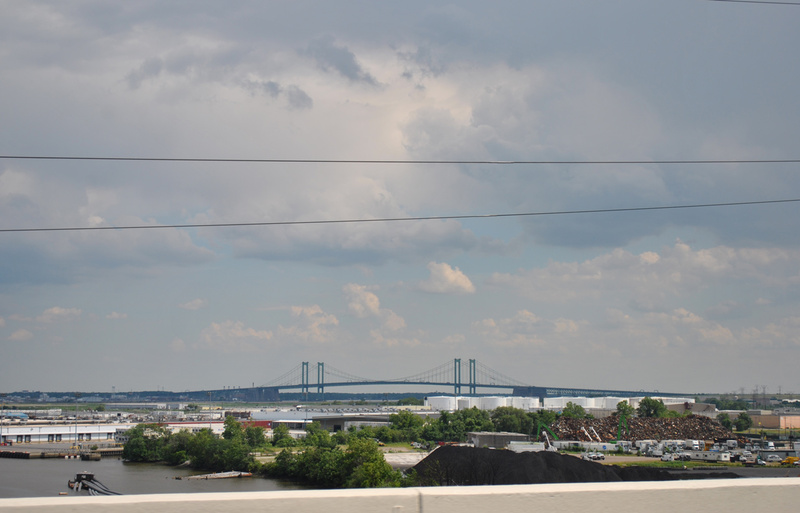 East of U.S. 13 & 40 (Dupont Parkway), the freeway opened in 1951 as the approach for the Delaware Memorial Bridge. Prior to 1993, Interstate 295 ended midway between I-95 Exits 4 (NJ 31) and 5A/B (Federal City Road), at a roadway separation along the Trenton Belt Line reserved for an interchange with the Somerset Freeway. 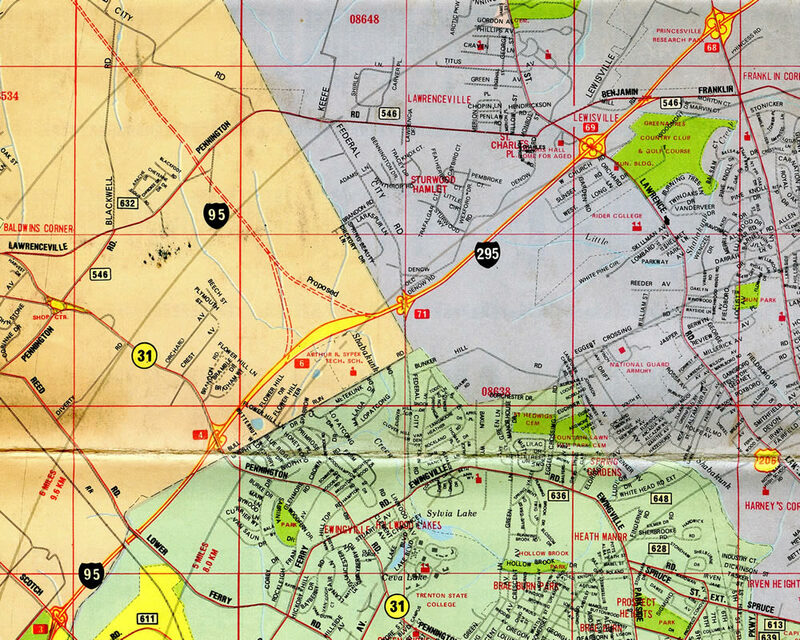 The Somerset Freeway was the planned alignment for Interstate 95 between Ewing and New Brunswick at Interstate 287. It was formally canceled in 1982. This left the I-295 north end point at a somewhat arbitrary location. Changes were made in 1993 to have I-295 begin and end at a major interchange (U.S. 1) instead of a random place.9 This resulted in I-95 gaining three miles, with interchanges from Federal City Road east to U.S. 1 renumbered. Looking southeast from the high rise bridge of I-495 over the Christina River in Wilmington at the Delaware Memorial Bridge. Photo taken 06/03/12. Interstate 295 crosses over the Pennsylvania Turnpike (I-276) mainline ahead of the flyover for southbound I-95. Photo taken 12/27/18. 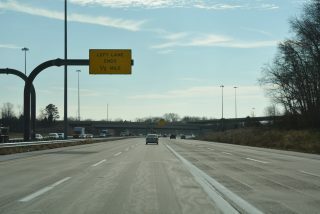 An end sign precedes the Ford Road overpass and I-295’s merge with I-95 south. Photo taken 12/27/18. Westbound I-295 merges with the left side of I-95 south through the directional T interchange with PA 413 to Bristol. Photo taken 12/27/18. Interstate 95 enters a directional T interchange (Exit 39) with the connector to PA 413 for Bristol one mile ahead of the split with I-295 east. Photo taken 12/27/18. Two lanes depart for PA 413 to Bristol. 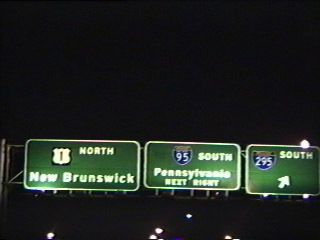 I-95 north advances another mile to Left Exit 40 with I-295 east to Trenton, New Jersey. Photo taken 12/27/18. Two lanes separate for both the continuation of I-95 north onto the Pennsylvania Turnpike east and I-295 to Langhorne, Newtown and Yardley. Photo taken 12/27/18. Interstate 95 follows the Pennsylvania Turnpike east to Bristol and the Delaware River Turnpike Toll Bridge to U.S. 130 at Florence Township. I-295 travels 10.8 miles north to the Scudders Falls Bridge. Photo taken 12/27/18. End I-295 / Begin I-95 sign posted midway between the Trenton Belt Line interchanges with Sloan Avenue and U.S. 1. This type of sign was typically used by NJDOT when an otherwise seamless route changed from one route number to another. Photo taken 08/30/05. Interstate 295 concluded at the directional cloverleaf interchange (Exits 67A/B) with U.S. 1 in Lawrence Township. The forthcoming exchange lies amid an area of wetlands and across the Delaware and Raritan Canal. Photo taken 08/30/05. A collector distributor roadway separates movements to U.S. 1 south to Trenton and north to New Brunswick from the Trenton Belt Line. Photo taken 08/30/05. 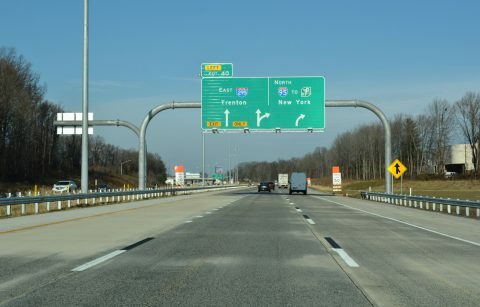 U.S. 1. constitutes a six-lane arterial with controlled access sections and interchanges as a free alternative to the New Jersey Turnpike northward to New Brunswick. Southward the route follows the Trenton Freeway to a toll bridge across the Delaware River. Photo taken 08/30/05. Interstate 295 north shifted directly onto Interstate 95 south. The Trenton beltway continues westbound to New Jersey 31 at Ewing, before turning south towards Bristol, Pennsylvania. Photo taken 08/30/05. 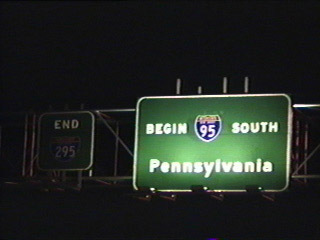 The first sign referencing the temporary end of Interstate 95 appeared at Exit 4 for NJ 31. This sign bridge was removed by 2011, with the NJ 31 panel moved to ground level. Just east of this location is a roadway separation built for the unconstructed interchange with the Somerset Freeway north. Photo taken by Carter Buchanan (06/30/05). Two miles ahead of the former end of I-95 at I-295. The ensuing exit joins the belt line with U.S. 206. Photo taken 07/20/05. Back to back ramps (Exits 8A/B) depart from the Trenton Belt Line for County Route 546 (Princeton Pike) ahead of the directional cloverleaf interchange (Exit 67) with U.S. 1. The guide sign for U.S. 1 here was moved onto a sign bridge added by 2008. Photo taken by Carter Buchanan (06/30/05). Motorists bound for the New Jersey Turnpike are directed 15 miles southward on I-295 to I-195 east. This sign was replaced by 2015. Photo taken 09/26/09. A fourth eastbound lane opens along the freeway between CR 546 (Princeton Pike) and the off-ramp (Exit 67) for U.S. 1. Photo taken 09/26/09. Three lanes of Interstate 95 north directly transitioned into Interstate 295 south as the Trenton Belt Line curves to Hamilton Township and the west end of I-195. 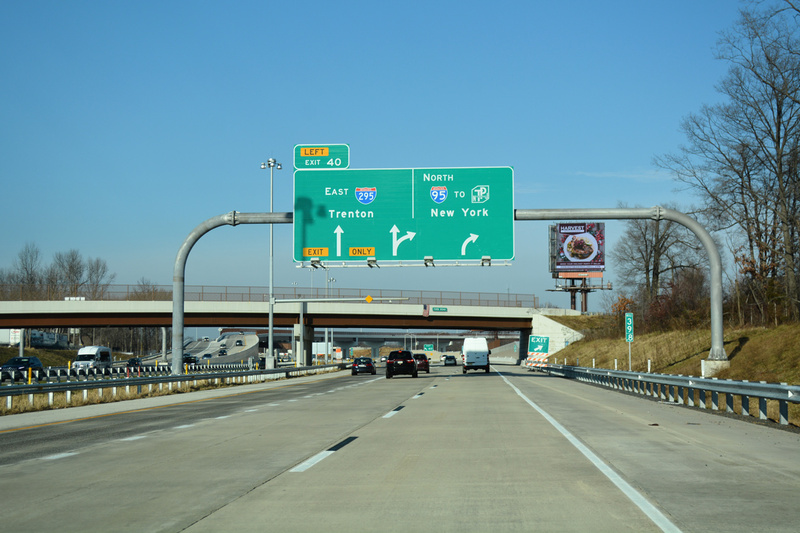 Exit 67 carries all traffic in unison for U.S. 1 south to the Trenton Freeway and U.S. 1 north to New Brunswick and Edison. Photo taken by Carter Buchanan (06/30/05). U.S. 1 travels through a full cloverleaf interchange with County Route 533 (Quaker Bridge Road) between Mercer and Quaker Bridge Malls on the 1.5 mile approach to the Trenton Belt Line. Photo taken 10/10/14. Southbound traffic narrows to three lanes and U.S. 1 passes by the Quaker Bridge Mall off-ramp. Several businesses line the southbound side of U.S. 1 ahead of the back to back ramps for Interstate 295. Photo taken 10/10/14. The original c/d roadway for I-95 south and I-295 south was altered to separate movements for Philadelphia. Two lanes join Interstate 295 leading west to Ewing Township and Newtown, Pennsylvania. Photo taken 10/10/14. A loop ramp follows for Interstate 295 south to Bordentown, Burlington and Camden. U.S. 1 transitions into a commercial arterial ahead of the Trenton Freeway southwest to Morrisville, Pennsylvania. Photo taken 10/10/14. One half mile ahead of the cloverleaf interchange with Interstate 295 (Trenton Belt Line) on U.S. 1 (Brunswick Pike) north. Photo taken 12/19/17. U.S. 1 north at the ramp for I-295 toward Bordentown and Camden. A loop ramp follows for the former nine-mile section of I-95 leading west toward Bucks County, Pennsylvania. Photo taken 12/19/17. Leaving the Farnhurst Interchange with U.S. 13 (Dupont Parkway), Interstate 295 proceeds northwest to the directional T interchange with I-95 and I-495. Work between February 2016 and December 2018 reconstructs this stretch of I-295 southbound. Photo taken 10/03/14. Interstate 495 separates from Interstate 95 north nearby to bypass Wilmington by the Port of Wilmington, Edgemoor and Claymont. Photo taken 10/03/14. Interstates 95 & 495 north pass over Interstate 295 at the northbound on-ramp for the city of Wilmington. I-95 serves the city central business district and interests northward to West Chester via U.S. 202 (Concord Pike). Photo taken 10/03/14. The two southbound lanes of Interstate 295 default onto the left side of I-95 toward Newark and the tolled John F. Kennedy Memorial Highway to Baltimore. Exit 5 (I-95 numbering convention) departs at the merge for Delaware 141 (Newport Freeway) north. Photo taken 10/03/14. Full coverage of Interstate 295 south at Interstate 95 posted at the AARoads Delaware guide for Interstate 295 south. Traffic from Delaware 1, a north-south toll road joining Dover with the Wilmington area, ties into Interstate 95 north ahead of Christina Marsh. This stretch was expanded to ten overall lanes in 2007-08 due to heavy traffic volumes at the forthcoming split with Interstate 295. Photo taken 10/05/14. Two lanes separate from Interstate 95 (Delaware Turnpike) north for Interstate 295 north to the Delaware Memorial Bridge. 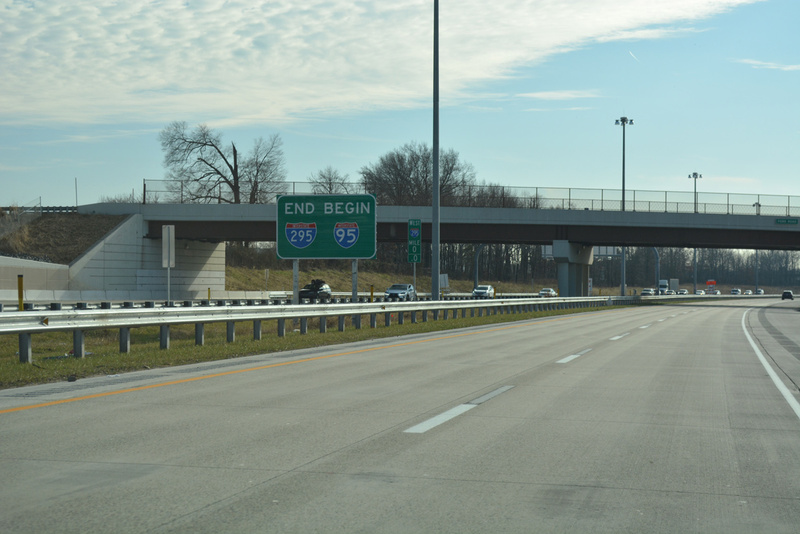 Local ramps also depart from the right for U.S. 202 & Delaware 141 (Basin Road) south to New Castle and the Newport Freeway north. Photo taken 12/19/16. Four lanes continue north along Interstate 95 to the adjacent wye interchange with Interstate 495 north. Both routes serve Wilmington and reconvene at the Pennsylvania state line near Claymont. Photo taken 09/27/14. 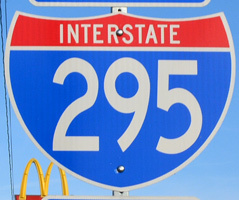 Interstate 295 begins at a unnumbered exit from I-95 north. A c/d roadway for Delaware 141 (Exit 5B) quickly follows. This exchange regularly sees traffic counts over 150,000 vehicles per day (vpd). During peak travel times, such as holidays and summer weekends, it is not uncommon to encounter long back ups stretching west to Delaware 273. Photo taken 09/27/14. Photos covering previous signage and lane allocations along I-95 north to the split with I-295 are posted on the Interstate 95 North – Delaware Archive page on AARoads. Interstate 95 & U.S. 202 travel the Wilmington viaduct from 4th Street (SR 9) to Maryland Avenue (SR 4) on their 1.75 mile approach to Interstate 295. The freeway funnels commuters from Downtown Wilmington to Newark and other west and southern suburbs. Photo taken 09/27/14. A left exit departs for I-295 north after the I-95 bridge over the Christina River. 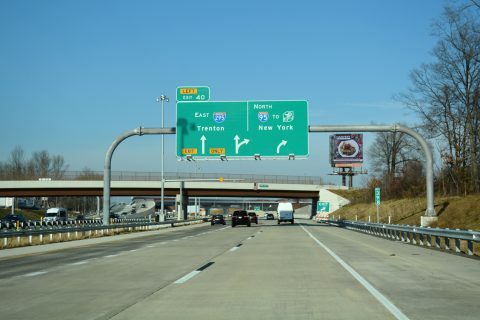 The upcoming exit serves both commuters between Wilmington and the New Castle area and long-distance travelers bound for the state of New Jersey. Photo taken 09/27/14. New arrow-per-lane (APL) signs for Interstate 295 on I-95 south were erected by December 2017. The previously unnumbered ramp was numbered as Exit 5C with the changes. Photo taken 12/20/17. Passing over a Norfolk Southern Railroad, just ahead of the northbound off-ramp for I-295 on Interstate 95 & U.S. 202 south. Beyond the ramp, I-95 merges with I-495 south at a wye interchange before entering a cloverleaf interchange with U.S. 202 south and Delaware 141 (Newport Freeway / Basin Road). Photo taken 09/27/14. Interstate 295 curves southeast to Farnhurst, where it combines with U.S. 40 east to the Delaware Memorial Bridge and New Jersey Turnpike. I-295 between I-95 and U.S. 13 (Dupont Parkway) opened in 1963, while I-95 through Wilmington did in 1965. Photo taken 09/27/14. Installed by December 2017, this APL overhead replaces the previous steel truss sign bridge by the Christina River. Photo taken 12/20/17. The lane configuration along I-95 south changed in 2000 to incorporate a lane drop with the departing ramp for I-295. This changed again in 2014 with the emergency closure of the Christina River Bridge for I-495, as I-95 was restriped with three through lanes. The off-ramp for I-295 is otherwise unnumbered. Photo taken 09/27/14. Full coverage of Interstate 95 south leading to I-295, including several interchange sequence signs, at Interstate 95 South – Delaware on AARoads. Previous looks at the left side ramp and approach of I-95 south to I-295 north posted at the Interstate 95 South – Delaware Archive page on AARoads. Interstate 495 parallels the Christina River west from U.S. 13 (Dupont Parkway) to the wye interchange with I-95 south. 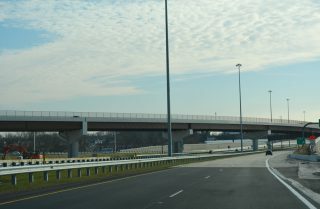 Additional ramps from I-495 provide access to Interstate 295 north and the c/d roadway for Delaware 141 (Newport Freeway). Photo taken 12/25/12. Two lanes of Interstate 495 south default onto the left side of I-95 south as a left exit departs for I-295 north. Photo taken 12/21/16. The I-295 exit from Interstate 495 south combines with the ramp from I-95 south ahead of the Farnhurst Interchange with U.S. 13 and 40 (Dupont Parkway). Photo taken 12/25/12. For the rest of the signs preceding the I-495 south approach to I-295 north and I-95 south, see Interstate 495 South – Delaware on AARoads. The connection from I-495 south to I-295 north has remained mostly unchanged over the years, with the exception of sign replacements. Older sign photos are posted on the Interstate 495 – Delaware Archive page on AARoads. 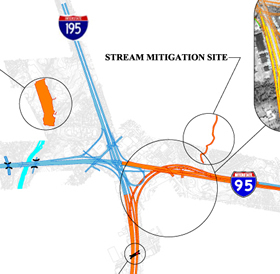 Background – Project Overview, PA TURNPIKE / I-95 INTERCHANGE PROJECT web site. “Re: I-95/Penna Turnpike Interchange” online posting by qguy, AARoads Forum, December 9, 2014. “N. 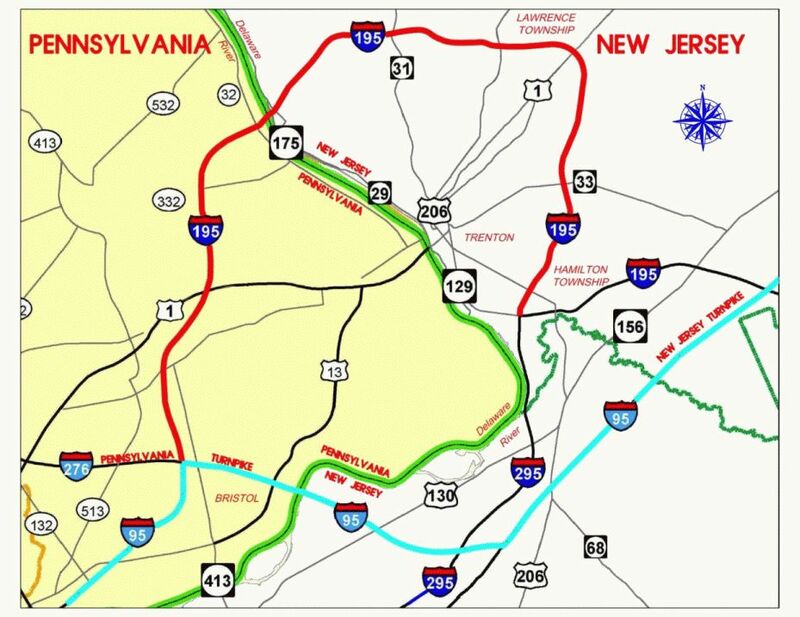 J. officials open $900 million project for I-295 snarl.” Philadelphia Inquirer, March 3, 2013. 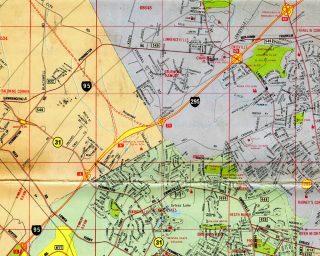 “Re: NJ – 295/76/42 Direct Connection Construction” online posting by jeffandnicole, AARoads Forum, December 19, 2013. “I-95 Scudder Falls Bridge $328M replacement project receives approval.” The Times (Trenton, NJ), June 25, 2012. “CONSTRUCTION FOR NEW BRIDGE GEARS UP.” The Times (Trenton, NJ), January 5, 2016. Interstate 295 (New Jersey) (PhillyRoads). “Trenton Complex to open.” The Times (Trenton, NJ), December 22, 1994. “Re: I-95/Penna Turnpike Interchange” online posting by akotchi, AARoads Forum, December 8, 2014. 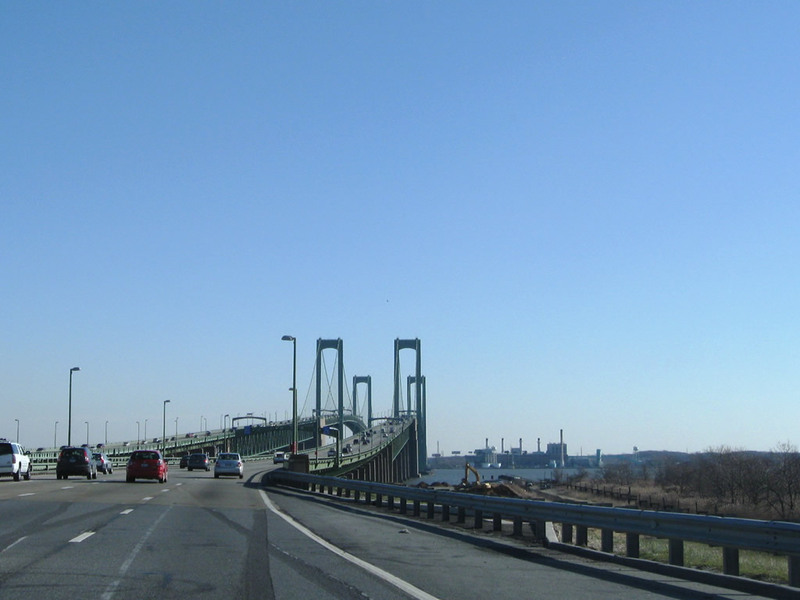 About the Delaware Memorial Bridge. Delaware River and Bay Authority (DRBA) web site. “A look back: Route 295.” Courier-Post, April 5, 2013. “Toll Schedule Approved for New Bridge.” Scudder Falls Bridge Replacement Project web site, accessed January 6, 2017. “I-295 Southbound Reconstruction Project near the Delaware Memorial Bridge to Commence Week of February 15, 2016.” Delaware River and Bay Authority, press release, February 12, 2016. “Drive north to go south … or is that west? Why they’re renumbering 95/295.” New Jersey 101.5, January 10, 2018. “Fifty Years in the Making — I-95 Finally Connects Maine to Florida With Opening of the ‘Missing Link’.” Construction Equipment Guide, October 1, 2018.